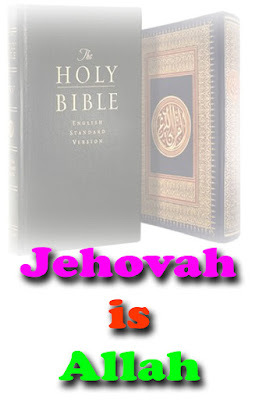 Home » Articles » Jehovah is Allah » “Yahweh” in Hebrew is... “Allah” in Aramaic & Arabic! “Yahweh” in Hebrew is... “Allah” in Aramaic & Arabic! The Hebrew term Jehovah which appears in Old Testament has been translated as Allah in Aramaic and Arabic New Testaments. To know this fact let us observe the below prophecy mentioned by Jesus that written in Aramaic New Testament in which Jesus mentions the name of God as Allah in the following. What important to note is that Jesus mentions the name of God in Aramaic as Allah. As a matter of fact, the above prophecy had been written in Old Testament Deuteronomy 6:13 in Hebrew in which we can see the name of God written to be Jehovah. But when Jesus mentions the same prophecy in Aramaic New Testament he changed the name as Allah. But what more important to note is that when the New Testament was translated in Hebrew this same prophecy has been translated as follows. If Jehovah and Allah are the two separate entities and two separate Gods as imagined by the present day preaches what for the then great christen scholars had translated the Hebrew name Jehovah as Allah in Aramaic and Arabic? Now let us see another below mentioned prophecy in Aramaic New Testament what Jesus mentions as follows. In the above prophecy Jesus says – “hear O Israel; The Lord ALLAH, The Lord is One” In fact this same prophecy had been mentioned in Old Testament Deuteronomy 6:4 in which it had been mentioned the name of God as Jehovah. But what more important to note is that when the New Testament was translated in Hebrew this same prophecy has been translated as follows. Thus in the Old Testament prophecies which have been written in Hebrew we can see the name of God to be Jehovah but when the same prophecy has has been mentioned in Aramaic New Testament the name of God that Jehovah, had been translated as Allah. We have known this fact so far analysis. If this be fact how far it is correct to say as Jehovah and Allah are the two separate Gods? Ponder over this fact. 0 Response to "“Yahweh” in Hebrew is... “Allah” in Aramaic & Arabic!"